Up until the past two years, food has been a small component of the programming. There was one community dinner in 2015, organized by those principles and AMC values, created as a launch for the queer and feminist visionary fiction anthology Octavia’s Brood. The next year was a collaboration with the Iraqi Transnational Collective and coincided with the Detroit Water Rights March; marchers joined the dinner at the end of the course. Last year’s meal was a collaboration with the Cambodian food pop-up Kreung and the urban farming training program at Earthworks Urban Farm. After the 2016 dinner, Ora Wise and Munira Lokhandwala—who organized and led the cooking of the community dinners—reflected on what they saw happening during these meals. “We sat back afterwards and were like, people are hungry for this,” Ora said. “People wanted to help cook, people were hungry for not just affordable, delicious food that’s produced in line with their values, but to have a space that was creative and uplifting.” So, in collaboration with several other chef-activist (the formal committee now includes Max Sussman, Kimberly Chou, Kate McCabe, Shane Bernardo, and Tara Rodriguez Besosa, in addition to Ora and Munira) they decided to do more with food at the conference, and proposed a track, a set of talks and workshops, beginning in 2017. 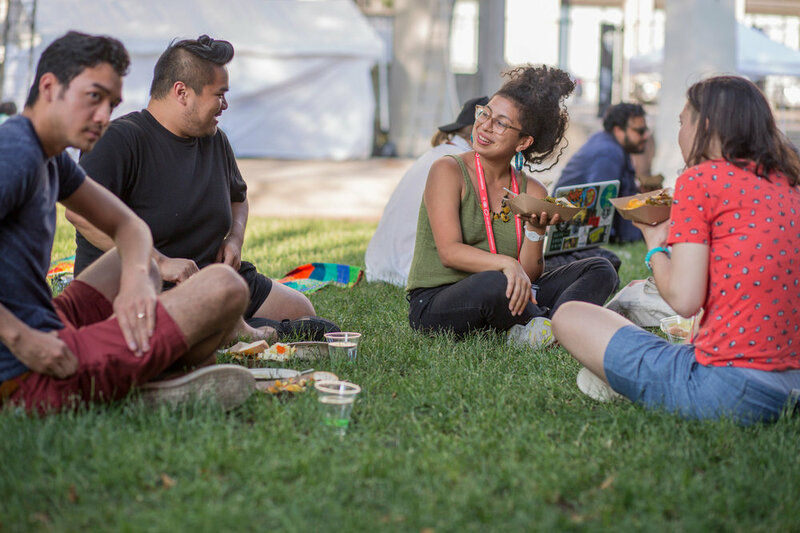 This year the food track is called FERMENT, an acronym for Fermenting Emergent Resistance Movements, Envisioning Nourishing Traditions, and it'll feature workshops and conversations to explore food as medium for nourishment in the most holistic sense, fostering community and collaboration, resistance and sovereignty. Pao Lebron, Tara Rodríguez Besosa, and others from the Cuir Kitchen Brigade Collective (cuir is the phonetic Spanish spelling of queer) will be participating in AMC events and the FERMENT track. Initially formed as a cultural exchange to connect the food movement in Puerto Rico and New York. Pao grew up in Puerto Rico, among the agriculture and agricultural traditions of the island, and later started working in the food movement based in New York; Tara is the founder of El Departamento de la Comida in Puerto Rico, a cafe and grassroots project focused on supporting local and sustainable agriculture. But in the aftermath of Hurricane Maria, the Cuir Kitchen Brigade turned to the urgent need of relief work. El Departamento de la Comida was flooded, and Tara focused entirely on rebuilding and supporting the local agriculture community in Puerto Rico, and the New York people of the Cuir Kitchen Brigade preserved local produce and sent it to Puerto Rico, an effort that highlighted many of their core values: supporting local farmers and working with seasonal produce, demonstrating how preserved food functions importantly in emergency preparedness, working collectively outside capitalist systems, and encouraging healthful and nutritious eating habits. They also created an educational platform to formalize this approach and share it with other groups and communities. And for this year's AMC, the Community Dinner will expand significantly by adding an all-day “Dream Cafe” to the offerings. Ora describes the Dream Cafe as “an entire week-long collaborative, equitable, sustainable, culinary festival within the broader convergence that the AMC is.” It’ll be structured around collaborative partnerships between urban farmers, local food businesses, food sovereignty organizers, and chefs within and beyond the Detroit area—“an epic experiment in community and food!” Ora said. Among its highlights is the collaboration of Chef Gabriela Álvarez of Liberation Cuisine with chef Gerardo Gonzalez of Lalito on a Detroit version of his Tres Leches event series, an all-you-can-eat buffet and party that creates and holds space for other POCs and queer folks. Members of the I-Collective—a collective of indigenous chefs, seed keepers, knowledge holders, and food sovereignty activists from around the Americas—will produce a dinner in collaboration with with local indigenous chefs. And working with the food business incubator Food Lab, there’ll be a culinary tent and farm stand that that highlights the people and importance of the cottage food industry as well as rotating breakfast and lunch pop-ups each day presented by partnered pairs of black-owned Detroit food businesses. If you’re based in New York, Jarry will be co-hosting a fundraiser at MeMe’s Diner on Monday, May 21st, 2018! Come for bites by KREUNG and KIT an’ KIN, both of whom will be featured in the Dream Cafe, and special cocktails. All proceeds benefit the Dream Cafe. Photos of the 2017 Conference by Ara Howrani, and provided courtesy Allied Media Projects.